Invited and supported by The Association for Cultural Diplomacy in The United Arab Emirates a group of military from Ukraine (students and officers of Hetman Petro Sahaidachnyi National Army Academy), who are members of ATO, stays at present in The United Arab Emirates. Our soldiers are accompanied by Fr. Stepan Sus, who is Head of Military Chaplaincy Center and parish priest of Saints Peter and Paul Garrison Church (Lviv). 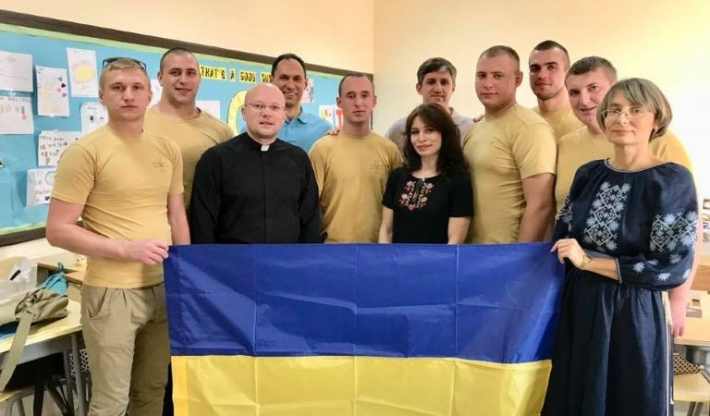 The Military and their chaplain visited the only Ukrainian school in the region, delivered a lecture for students and met Consul of Ukraine in Dubai Balanutsa Oleksandr.